Michigan is the only American state split into two distinct regions, comprised of its Upper and Lower Peninsulas, which span shoreline along four of the five Great Lakes. More than 11,000 inland lakes are also located throughout the state, ensuring that no state resident or visitor is ever more than six miles from a natural water source. 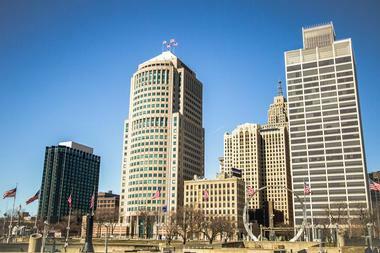 Major cities such as Detroit and Grand Rapids are cultural hubs throughout the American North, home to museums documenting the region's rich automobile production and R&B music legacy. Beaver Island is Lake Michigan's largest island, located within the Beaver Island archipelago approximately 32 miles off the coast of the city of Charlevoix. The island is historically known as the site of a former American religious separatist monarchy, led in 1856 by the Strangite Mormon Church. Since the 1970s, it has become a popular tourist destination in the American Midwest, accessible only via private airplane or ferry service from the mainland Beaver Island Boat Company. It is known as "America's Emerald Isle" due to its high population of Irish-American residents and is home to a biological research outpost operated by Central Michigan University, which offers tours and workshops for students and visitors. Recreational opportunities abound during the summer months, including pristine beaches, nature trails, and an 18-hole golf course and marina. Escanaba is a Michigan lakefront city along the state's Upper Peninsula along Little Bay de Noc, home to a population of more than 12,000 residents. 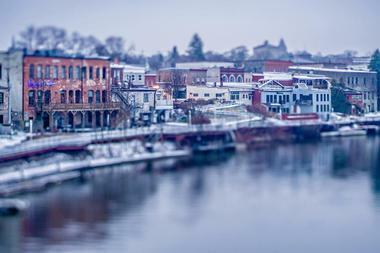 The city is home to a quaint downtown shopping and dining district, featuring boutique stores, chocolatiers and candy shoppes, and a variety of restaurants serving the region's unique "Yooper" cuisine. 213 miles of beautiful shoreline are showcased throughout the Delta County region, the largest county shoreline within the continental United States. Outdoor recreational opportunities abound in the Hiawatha National Forest, including opportunities for fishing, hiking, swimming, and biking. The region is also known as a major Midwestern brewery and winery hub, offering many tour options for sampling locally-produced wines and beers. Estivant Pines is a 508-acre nature sanctuary in Keweenaw County, Michigan that is home to the Midwest's final remaining old-growth white pine forest. 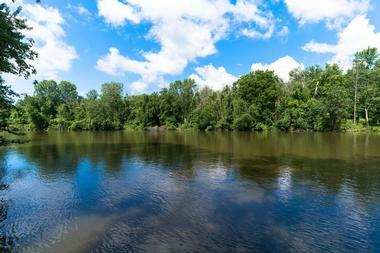 The preserve's lands were acquired by the Michigan Nature Association in 1973 after a statewide public fundraising campaign and remains one of the state's most popular nature sanctuaries today. Two walking trails loop through the land past towering white pine trees, some of which are more than 300 years old and reach heights of above 100 feet. Within the pine forest, 85 species of birds can be observed, including species of hawks and woodpeckers. During the winter months, the sanctuary offers opportunities for snowshoeing and cross-country skiing along its trail system. The Great Lakes Bay Region spans six cities along the Lake Huron's 1,143-square-mile Saginaw Bay, located along Michigan's eastern coastline. Popular destinations include Bay City, which is home to the expansive Bay City State Park and the newly-redesigned City Market, and family-friendly Birch Run, which offers one of the Midwest's largest outlet malls and outdoor attractions such as the Wilderness Trails Zoo and the Alpine Mountain Adventure Park. Historic Frankenmuth is home to German-themed attractions and historic sites, while Midland is known for outdoor attractions Dow Gardens and Whiting Forest, which are home to the country's longest canopy walk. 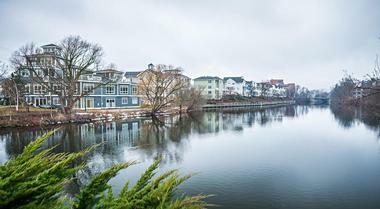 The city of Chesaning is a great getaway for romantic overnight stays, offering cozy inns and bed and breakfast facilities. In Saginaw, visitors can enjoy attractions such as the Japanese Cultural Center and Tea House, Saginaw Children's Zoo, and SVRC Marketplace. Isle Royale National Park is an 893-square-mile national park along a cluster of islands within Lake Superior, located near the United States-Canada border. The park preserves significant lands that were used throughout the 19th century as copper mines and resort communities, converted back into car-free natural forest and lake ecosystems full of native flora and fauna, including wolves and moose. 165 miles of hiking trails are offered throughout the park, including the Greenstone Ridge Trail, which connects Rock and Windigo Harbors. Backpacking and day hiking trips are visitor favorites, with 36 campground sites offered throughout the island. Other popular activities include fishing, scuba diving, ranger-led talks and hikes, and guided boat tours throughout the region. 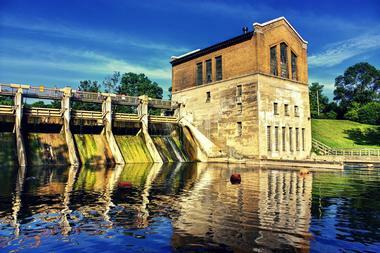 Manistee is a historic city within Michigan's Manistee County, home to a population of just over 6,000 residents. The town was known in the 19th century as a major logging industry and shingle manufacturing center and formerly headquartered its own railroad throughout the 1880s. Today, it preserves a large number of Victorian-era buildings within its downtown district, which is listed on the National Register of Historic Places. Local film studio 10 West Studios has produced major motion pictures starring Hollywood celebrities such as Christopher Lloyd, John Ratzenberger, and Randy Travis, while the city's historic Vogue Theatre has been recently restored as part of a campaign supported by filmmaker Michael Moore. Other historic and cultural attractions include the Arcadia Area Historical Museum, the Brethren Heritage Museum, and the Kaleva Train Depot Museum. Opportunities for outdoor recreation and scenic drives abound throughout the county region, which is home to the beautiful Arcadia Overlook and Manistee National Forest. Palms Book State Park is a 388-acre public nature preserve within Thompson Township in Michigan's Upper Peninsula, originally established in 1926 by John I. Bellaire and stocked with visitor amenities during the 1930s as part of a development project by the Civilian Conservation Corps. 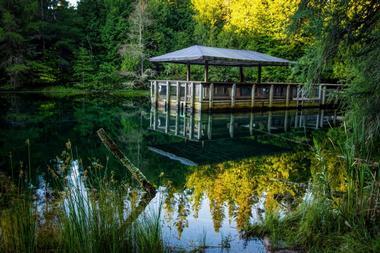 The park is the site of the Upper Peninsula's famed Kitch-iti-kipi "Big Spring," the state's largest freshwater spring, which runs 40 feet deep and gushes more than 10,000 gallons per minute. Self-operated observation rafting opportunities are offered for up-close exploration of the spring, showcasing giant trout within the spring's waters. 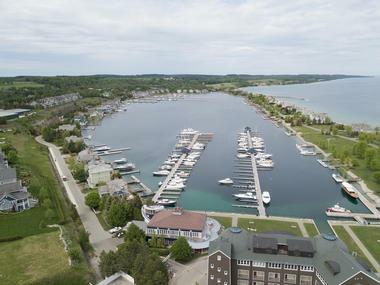 The Petoskey Area is home to six waterfront resort communities centered around the city of Petoskey, a northern Michigan community located on the Little Traverse Bay. The region is best known for its inclusion in Ernest Hemingway's Nick Adams stories and is home to large deposits of Devonian Period deposits called the Petoskey Stone, which are the official state stone of Michigan. Petoskey's Gaslight Shopping District downtown hub is home to a wide variety of quaint stores and restaurants, including several local wineries and breweries. Nearby, the waterfront resort areas of Bay Harbor, Harbor Springs, Boyne City, Alanson, and Walloon Lake offer rental properties and opportunities for shoreline recreation. Pictured Rocks National Lakeshore is a 42-mile preserved lakeshore along Michigan's Lake Superior coastline, spanning a total land area of more than 73,000 acres throughout the state's Upper Peninsula region. It was originally preserved in 1966, becoming America's first national lakeshore, and welcomes more than 475,000 annual visitors each year for ample outdoor recreational opportunities, including boating, fishing, and swimming along its beautiful beachfront areas. 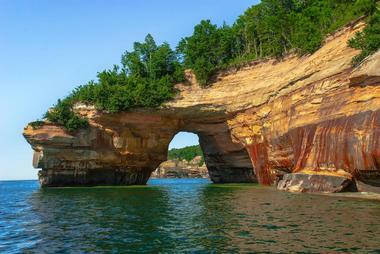 Unique natural environments are preserved, including its namesake colorful Pictured Rocks cliffs and the Miners Castle and Chapel Rock sandstone formations. More than 100 miles of hiking and biking trails are offered throughout the lakeshore, along with opportunities for backcountry camping and hunting in several areas. Preserved historic attractions include the 19th-century Au Sable Point Lighthouse, which is famously surrounded by the remnants of a number of historic shipwrecks. Sleeping Bear Dunes National Lakeshore has been called "America's Most Beautiful Place" by Good Morning America, spanning more than 35 miles of beachfront area throughout the state's eastern coastline along Lake Michigan. 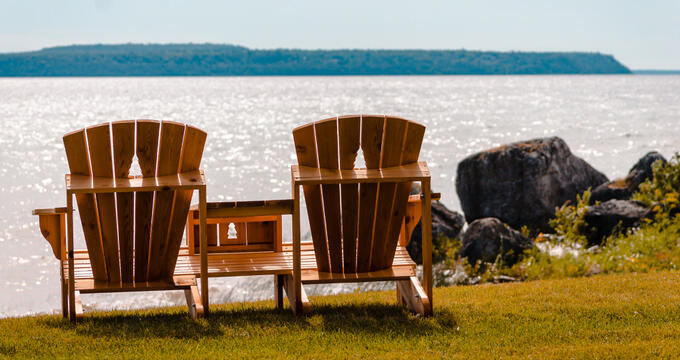 The lakeshore was originally established in 1970 for its significant dune and glacial natural formations and showcases stunning 450-foot bluffs along its coastline, along with a number of forested ecosystems and inland lakes. In addition to its mainland areas, the lakeshore also encompasses land on nearby North and South Manitou Islands. Cultural attractions throughout the lakeshore include preserved United States Lifesaving Service stations and the historic South Manitou Island Lighthouse, originally constructed in 1871. Loon Lake offers opportunities for swimming, fishing, and kayaking, while the Sleeping Bear Heritage Trail provides hiking and biking routes. 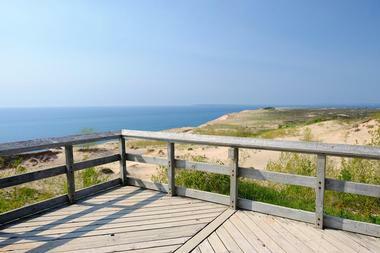 For visitors looking for a less wild experience, Pierce Stocking Scenic Drive loops for 7.4 miles, offering chances to see the park's famed sand dunes from inside vehicles. St. Ignace is an Upper Peninsula city located along the northern end of the Straits of Mackinac, home to a population of more than 2,400 residents. 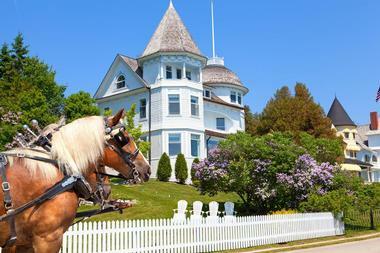 The historic community dates back more than three centuries, connected to the Lower Peninsula via the Mackinac Bridge, which links it to Mackinaw City. 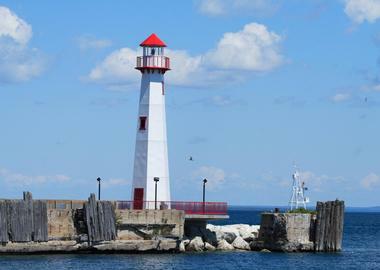 Cultural attractions include the Wawatam Lighthouse, overlooking the city's harbor, and the Museum of Ojibwa Culture, which preserves the region's rich indigenous history and former Jesuit mission. The city is home to a large Chippewa indigenous population, including the Sault Tribe, which operates the Vegas-style Kewadin Casinos. Prominent natural wonders include the Castle Rock limestone stack and the Rabbit's Back promontory, which overlooks Lake Huron. Downtown transportation service is provided by the St. Ignace Trolley, while connecting ferry service is offered to nearby Mackinac Island. Sugarloaf Mountain is a 470-foot granite peak near the city of Marquette, located along the Upper Peninsula's Lake Superior coastline. The mountain is the most popular of three regional overlook sites, maintained as a visitor site by Marquette County. 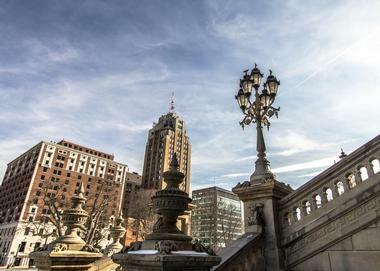 It is accessible via a series of 304 wooden stairs that embark from the site's parking lot, with three lookout platforms available at the peak for stunning views of the region's Great Lakes shoreline and landmarks such as Ore Dock, the Superior Dome, and Presque Isle Park. Visitors may also hike up the mountain's backside using a moderately-strenuous several-mile hiking route that is accessible from a parking lot near Wetmore Landing. Tahquamenon Falls State Park is the second-largest state park in Michigan, spanning more than 46,000 acres throughout McMillan and Whitefish Townships along the path of the Tahquamenon River to its output at Whitefish Bay in Lake Superior. The park receives more than half a million annual visitors and is named for its gorgeous Tahquamenon Falls, which features a spectacular 50-foot drop and is the second-largest waterfall in the eastern United States after Niagara Falls. 22 miles of hiking and biking trails are offered throughout the park, providing visitor access to undeveloped ecosystems filled with native flora and fauna. Other outdoor recreational opportunities include canoeing, fishing, cross-country skiing, and snowmobiling, with a seasonal restaurant and four campgrounds operated on park property. Thorne Swift Nature Preserve is a 30-acre nature preserve located along the banks of Lake Michigan near the city of Harbor Springs, open to the public daily from dawn to dusk between Memorial Day and Labor Day. 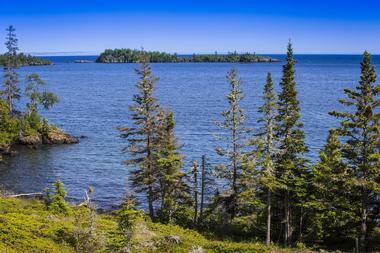 The preserve was established in 1981 following the donation of lands by Elizabeth Kennedy to the Little Traverse Conservancy. A mile and a half of visitor trails are offered, including the half-mile Balsam Trail and the Beach Trail, which leads to the preserve's Kennedy Nature Center. Bird watching is a popular activity at the Dune Observation Deck, including opportunities to spot nesting gulls, warblers, and chickadees. Naturalist-led programming is offered throughout the season, including nature crafting classes and themed group hikes. Bond Falls Scenic Site is one of Michigan's most spectacular natural wonders, located in southern Ontonagon County near the city of Paulding. The site showcases a stunning 50-foot waterfall drop divided into a number of beautiful cascades along the Ontonagon River, which are viewable from a 600-foot ADA-accessible visitor boardwalk. Three viewing platforms and six overlooks are offered along the boardwalk, creating perfect opportunities for stunning photographs of the falls. 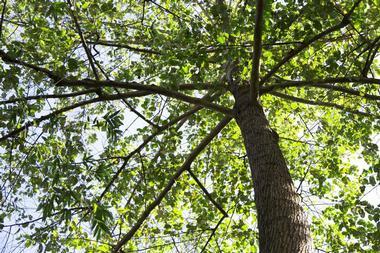 Hiking opportunities are also available along a number of nature trails near the site. Roadside picnic tables are offered at the site, along with a number of overnight camping sites at Bond Falls Flowage.